Hartford, Connecticut- Friday March 29th Jimmy Burchfield’s Classic Entertainment and Sports (CES MMA) will take their show on the road to Hartford, Connecticut where they will host the first sanctioned MMA event in the state of Connecticut outside of reservation soil. 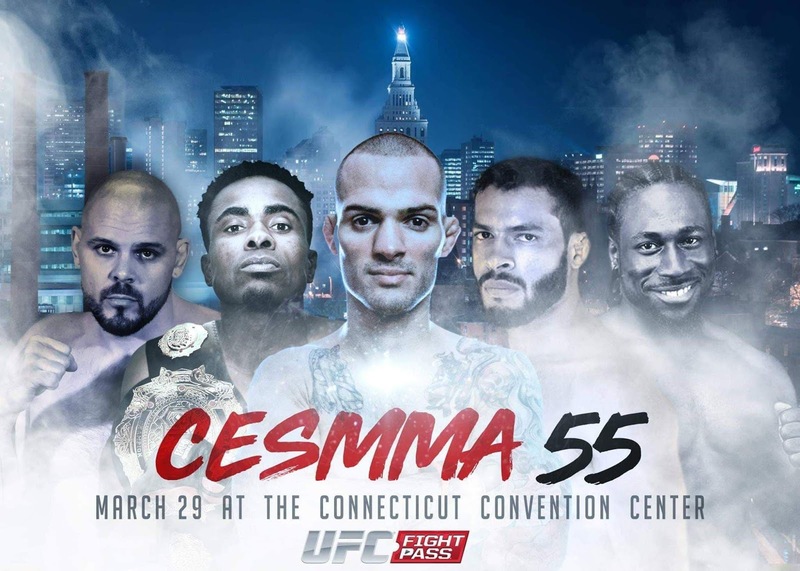 The CES cage will plant itself smack dab in the center of the Connecticut Convention Center in downtown Hartford, as the the stage is set for CES 55. Two coveted CES Championship belts will be on the line Friday night as Champions Tony Gravely (17-5) defends his Bantamweight title against Darren “The Mean One” Mima (10-7) and Jeremiah Wells (6-1-1) defends his Welterweight strap for the first time against Vinicius De Jesus (7-2) in the main event, of an absolutely stacked main card. Also, Friday marks the return of CES fan favorite Matt “The Mangler” Bessette (22-9) from a stint in the UFC, to his hometown of Hartford, for the promotion he will always call home; CES MMA. A pair of Connecticut’s own; William “Knightmare” Knight (4-0, against Carlton Little ) and Dan Dubuque (7-2, against Antonio Castillo Jr.) help round out a main card that kicks off live, on UFC Fight Pass, at 9 pm Eastern with two former UFC Middleweights; Eric Spicely (10-4) and Caio Magalhães (10-6) to set the stage for the live telecast. CES’s own Michael Parente and former UFC Fighter “Filthy” Tom Lawlor will have the call for what promises to be a historic evening along the banks of the Connecticut River. The action doesn’t stop there however, a five fight undercard will open the festivities as first bell at CES 55 will sound at 7 pm. CES veterans litter the undercard, which gets underway in the Middleweight division as Carlos Rivera (1-4) meets Mike DiOrio (1-3). Lightweight Gil Pinheiro (0-3) makes his second straight CES appearance as he welcomes New York’s Tom Connolly (Debut) to the professional ranks. Undefeated monster; Fabio Cherant (4-0) will rematch with Marquis Allen (1-3) at Light-Heavyweight. Highly touted prospect Justin Valentin (2-0) makes his second walk to the CES cage as he locks horns with Minnesota’s Jason Huntley (5-8) and Hilarie Rose (2-1) faces off with yet another tough test in Rosa Acevedo (4-3). For tickets to CES 55 visit the CES website at CESMMA.COM or by calling (401) 724-2253. Click below for our breakdown of the entire CES 55 Fight card. Last fight: First round Submission (Arm Triangle) loss to Bob Burton at CES 10: Never Surrender (4/2012). Last fight: Unanimous decision loss to Andrews Rodriguez at Bellator 208. Breakdown: Connecticut’s own Carlos Rivera will put his seven year hiatus to rest Friday night as he returns to the CES cage for the first time since CES 10 for the opportunity to fight in his home state of Connecticut. The thirty one year old Rivera hopes that teaming up with Underdog BJJ will help him close the holes in his submission game, as he looks to get his hand raised one more time. Standing across from Rivera will be a battle tested Mike DiOrio, who, since opening up his pro career with a win, by split decision against Sean Evans at Premier FC 23, has lost three straight fights against some tough competition across both King of the Cage and Bellator promotions. Both of these guys have a lot to prove, not only to the fans but to themselves as I expect to learn a lot about both fighters in this match up. Last fight: Second round Submission (Rear Naked Choke) loss to Eugene Aubry at CES 54: Andrews v. Logan. Breakdown: Don’t let the 0-3 record fool you, Gil Pinheiro has been locked in the cage with some of the toughest Welterweights in the region having come up short against Vinicius De Jesus (7-2), Kemran Lachinov (8-2) and Eugene Aubry (3-0) to start his professional career. Pinheiro looks to notch his first professional victory Friday night against fellow striker; Tom Connolly. Connolly will be making his professional debut after going 6-3 as an amateur with five wins coming by way of knockout. Connolly comes to CES a veteran of Gladius Fights in upstate New York and he will be looking to secure himself a spot on the CES MMA roster with what would be an impressive debut if he can get by the battle tested Pinheiro. Light-Heavyweight *Fight Scrapped - Allen did not show"
Last fight: Second round Submission (Rear Naked Choke) victory over Ron Marshall at CES 53: Gravely v. Nordby. Last fight: No Contest (Unintentional Eye Poke) with Chad Kelly at Caged Thunder 5. Breakdown: Fabio Cherant and Marquis Allen will throw down in what will be a rematch of their bout at CES 50 that saw Cherant pull guard on a standing Guillotine to coax the first round tap from the striker Allen. Fabio has been talking a lot about the improvements he has made in his stand up game under the tutelage of striking coach Jose Santos, and is excited to show off those skills when he squares off with the familiar; Allen. Marquis however, may not be the kind of guy you want to test your stand up skills against, just ask Dan Randall, Allen took just 16 seconds to dispatch Randall via Knockout in his CES debut at CES 36 in 2016. Allen will be itching to let those hands fly once again as he gets another shot at the physical specimen; Fabio Cherant. Last fight: Split-Decision victory over Ron Leon at Reality Fighting 102: New Year’s Bash 3. Last fight: First round Knockout (Strikes) loss to Sean Strube at LFA 61: Allen v. Murrietta. Breakdown: Underdog BJJ product Justin Valentin has dispatched some pretty big names on his way to earning top prospect status. A well rounded athletic fighter, the sky's the limit for the 28 year-old Valentin, who looks to be hitting his stride at the right time. Valentin faces the most experienced opponent to date, as Minnesota native Jason Huntley makes his stop on the New England fight scene for the first time in his career. The 40 year-old Huntley has dropped six of his last seven contests as he seeks his first win since 2017, Valentin hopes to make a statement against Huntley and further vault himself up the New England Flyweight ranks. Last fight: Second round TKO (Ground and Pound) of Ivana Coleman at CES 51. Last fight: Unanimous decision loss to Lacey Schuckman at SCL 62: Unbroken. 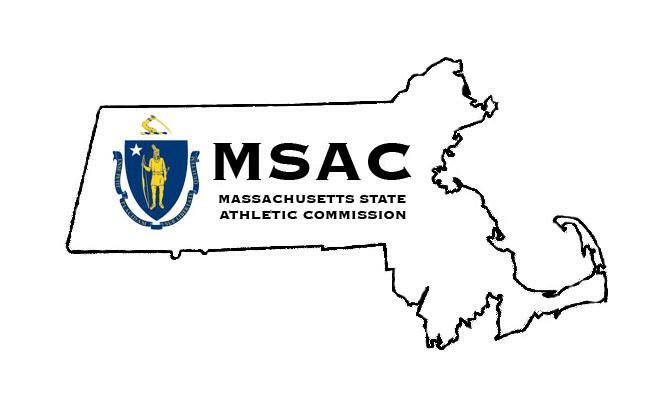 Breakdown: Massachusetts’ Hilary Rose is an absolute spark plug at 115 pounds, constantly risking life and limb to push her opponent to the brink of defeat. Hilary’s two professional wins have come by finish against some pretty tough girls, but none tougher than the one standing across the cage from her on Friday night. Rosa Acevedo is a grinder as well and will be gunning for her fifth professional victory and an upset of the “hometown” favorite; Rose. Hilary knows that a big time victory here puts her into contention for New England’s best Professional Strawweight. Last fight: First round TKO (Ground and Pound) victory over Leo Pla at CES 54: Andrews v. Logan. Last fight: First round Knockout (Punches) loss to Sadibou Sy at PFL 2018 #7. Breakdown: In an intriguing matchup of Brazilian Jiu Jitsu practitioners former UFC Middleweights; Eric Spicely and Caio Magalhaes take to the CES cage. Rhode Island’s Spicely made his return from the UFC a successful one at CES 54, stopping Leo Pla somewhat uncharacteristically, with strikes in the first round. Often regarded as having some of the best submissions in the UFC’s Middleweight division, Spicely will likely be locked into a chess match with the also submission happy Caio Magalhaes. Magalhaes is currently suffering through the toughest stretch of his career, dropping five of his last six bouts including fights for both the UFC and PFL. Magalhaes will be fighting in the state he now calls home, for the first time in his career since relocating from his native Fortaleza, Ceara, Brazil to the Teixeira MMA team in Bethel, Connecticut. This is a very interesting stylistic matchup between two submission specialist that could have CES Middleweight title implications in the not so distant future. Last fight: Split-Decision victory over Johnny Campbell at Cage Titans 41. Antonio “The Mexican Muscle” Castillo Jr.
Last fight: Unanimous decision loss to Frank Caraballo at WFC 99. Breakdown: Cage Titans Lightweight Champion Dan Dubuque holds the belt at 155 pounds for the Plymouth, Massachusetts based promotion and has widely drawn praise as one of the most promising up and coming fighters in all of New England. Dubuque isn’t flashy, but his overall fight I.Q. is some of the best around as his impressive resume will show, Dan is a tough out for anyone. Riding a current three fight win streak, Waterbury’s Dubuque has never been finished in his career, including his run at the amateur level. Dubuque will be looking for an all out war against the incumbent Antonio Castillo Jr. as both fighters have gone to decision in 70% of their professional victories. Castillo has had a rough go of it lately ending up on the wrong side of six of his last seven decisions and the competition doesn’t get any easier as Dubuque is set to welcome Castillo to the New England ranks in the CES cage. Last fight: First round TKO victory over Kevin Haley at CES 54: Andrews v. Logan. Last fight: Unanimous decision loss to Yorgan De Castro at CES 54: Andrews v. Logan. Breakdown: Don’t get me wrong, William Knight is one of the nicest guys you would ever want to meet, outside of the cage, but once the cage door closes and the pin drops; Knight flips a switch and becomes one of the scariest humans I have even witnessed. That type of savagery was on display at CES 54, when Knight secured the biggest win of his career by stopping Veteran Kevin Haley with unanswered strikes in the first round. With all four of his professional wins coming by way of Knockout, Knight has one speed and that speed is: GO! And don’t expect Knight to stop until the referee is pulling him off the top of you. Knight’s opponent Carlton Little is no stranger to knocking people out either, six of his seven professional wins have come in that fashion. Little showed a lot of heart in his Decision loss to Yorgan de Castro at CES 54, but let’s be honest, we shouldn’t be needing scorecards in this one, with the amount of power in the cage when these men collide, someone is getting Knocked Out! Last fight: Fourth round Knockout (Hammerfist) victory over Kris Moutinho at CES 54: Andrews v. Logan. Last Fight: Unanimous decision loss to Imran Bukuev at ACA 91. Breakdown: Virginia’s Tony Gravely began his reign as the CES Bantamweight Champion with “the slam heard ‘round the world” in November at CES 53 against Kody Nordby (9-5). Anxious to defend his title; Gravely returned just 10 weeks later and dispatched top contender Kris Moutinho (7-3) by TKO in the fourth round at CES 54 cementing his spot atop the Northeast’s Bantamweight ranks. When Gravely’s King of the Cage Bantamweight title defense, scheduled for March 10th, was cancelled, Gravely signed to defend his CES Bantamweight strap once again. The former Appalachian State Wrestling standout is probably one of the most polished fighters walking the New England circuit today and could be one or two big wins away from the UFC roster. Gravely will be looking for one of those “big wins” as he plays host to the return of former New England Bantamweight contender; Darren “The Mean One” Mima. New York’s Mima was once one of the top Bantamweights in the region, fighting to an impressive 9-4 record before signing with the Russian promotion; Absolute Championship. After four fights on foreign soil saw Mima go just 1-3, The Mean One returns to New England where he looks to climb back up the Bantamweight ladder. 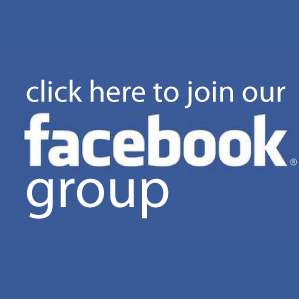 Mima hopes to make that climb a quick one, as he aims for the top rung against the best Bantamweight on the Atlantic, in Champion; Tony Gravely. Last fight: Split-Decision loss to Steven Peterson at The Ultimate Fighter 27 Finale. Last fight: Second Round Knockout loss to Bill Algeo at Ring of Combat 61. Breakdown: Let’s face it; if you don’t know the name Matt Bessette, you are probably not reading this article. The former CES Featherweight Champion departed the CES promotion the same way most of their champions do, through the UFC. The Mangler had a tough go of it at the sports highest level, but it had little to do with his performance, Matt performed like the warrior he is over six hard fought rounds under the bright lights of the UFC, but when the dust settled the judges handed Bessette two narrow decision losses. Bessette however, did get to show the world what he is all about, Bessette stood toe to toe with both Enrique Barzola (15-3-1) and Steven Peterson (17-8) and never blinked. Even though Matt did not come away from The Octagon with a win, he returns home to a hero’s welcome at CES, where the fan favorite has gone 6-1 over the last 5 years as the promotion’s most decorated and beloved Featherweight. Bessette will also be fighting in his hometown of Hartford, Connecticut for the first time as he welcomes Trenton, New Jersey’s Tim Dooling to the CES cage for the very first time. The 27 year-old Dooling, has dropped two of his last three contests, albeit to two very talented opponents in the form of Julio Arce (15-3) and Bill Algeo (12-3), Dooling will without a doubt be facing his stiffest test to date as he draws Matt “The Mangler” Bessette, on home turf! Last fight: Unanimous decision victory over Jason Norwood at CES 52: Wells v. Norwood to capture vacant CES Welterweight World Title. Last fight: First round Knockout of Rodolfo Barcellos at Bellator 216. Breakdown: Newly Crowned CES Welterweight World Champion; Jeremiah Wells set down contenders Gary Balletto Jr., Jon Manley and Jason Norwood on his way to capturing CES gold at CES 52 with a dominant performance over five rounds against Jason Norwood (18-6). After the brief retirement of former CES Welterweight Champion Christopher Curtis, Jeremiah Wells seized the opportunity and cleaned out the CES Welterweight division one by one on his way to capturing the vacant spot left by the retired Curtis. Wells’ march through glory doesn’t get any easier at CES 55; as his first title defense comes against former Bellator MMA fighter and CES newcomer Vinicius de Jesus. Wells has made his mark in the CES cage with overwhelming aggression, volume and power with his hands. Wells outpointed both Manley and Norwood for the duration of their bouts, not allowing his opponents to execute any type of game plan without having to defend the relentless offensive output from the Champion. Wells also took just 57 seconds to crumble the jaw of top prospect Gary Balletto Jr. (5-2) in his promotional debut in April of last year. Wells has drawn some well deserved high praise in this first year with the CES promotion and he will look to keep that train rolling right through another tough test in new comer de Jesus. De Jesus has made his name in the Bellator ranks with a slightly different approach to his striking game than that of Wells, de Jesus likes to do his work from the outside and picks his opponents apart with his counter-striking. De Jesus also possesses some high level jiu jitsu when the fight hits the mats, leading to two career stoppages by submission to go along with three career knockouts. The Champion; Wells, also carries with him some dangerous submission skills, being an understudy of the Legend Renzo Gracie, although the Champion hasn’t yet had to dig into that bag of tricks inside the CES cage. This should be an interesting and entertaining fight that could go either way, this is as high level a Welterweight fight that could be made in the New England region, with the region’s highest Welterweight honor on the line, Wells’ CES Welterweight Crown!